CHIN,KWAI SIN of Providence passed away at home unexpectedly on June 7, 2018. 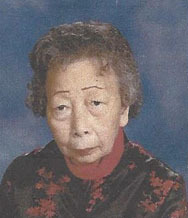 She was born in Toisan, Guangzhou Province, China on January 29, 1931 and was the widow of Stanley Chin. Kay worked for China Sea Restaurant in Warwick with Stanley for a few years with family members. Then Kay worked for a local jewelry manufacturer for many years and was a special trained assembler of designer jewelry working closely with the owners before retiring. Kay was a 38 year member of Beneficent Congregational Church in Providence and was a faithful attendee. She volunteered as a Sunday teller for many years and also enjoyed helping in the kitchen to prepare church dinners. In addition to her husband, Kay is predeceased by an infant daughter and six brothers and one sister. She is survived by many nieces and nephews, grandnieces and grandnephews and cousins and close friends. Family and friends are invited to Kay's funeral on Wednesday, June 13, 2018 at the Stapleton Family Funeral Home at 684 Park Avenue, Cranston starting with visitation at 9 am and the funeral service will start at 10 am. Burial will be at the Pawtuxet Memorial Park at 100 Harrison Avenue, Warwick, RI.